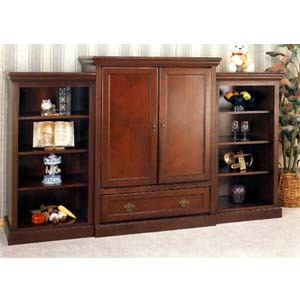 Cherry Finish Entertainment Center. Includes; Medium Size Center Entertainment Wall Unit 3404 (CO), Left And Righ Pier Unit Wooden Shelves (3404L (CO), 3404R (CO)). Easy To Assemble. Details: Center Unit: Lenght: 44-1/2 X Width: 22 X Height: 54. Left And Right Pier Units: Lenght: 24 X Width: 16 X Height: 48.